Cleaning and protection of the sculpture were performed to prevent oxidation of the bronze, as well as disfiguration of the original patina. Idan Zareski states, "'La Nena' is young, petulant, exuberant, and free, communicating her joy through a natural and playful pose. Her huge feet indirectly remind us that we all walk and share a common ground, this magnificent planet, which we often too easily take for granted. 'Minifoot' carries her legacy in the most joyful manner, wonderfully animated by love. she is a messenger of peace." The transformation of the once rundown district of Wynwood into the internationally renowned open-air museum was thanks to the determination of a group of local who launched Primary Flight and invited grafitti and street artists to paint the empty wall of the warehouses. As a result, the property values have gone up and developers are tearing down buildings and murals. Galleries and artists are now moving out due to the high rent. 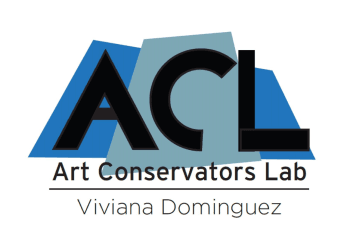 Does the conservator play a roll as agent/facilitator in raising consciousness and helping the community keep the spirit of street art in this Wynwood trend alive? Today, there are more than 170 murals remaining. Viviana Dominguez: Miami-based art conservator, has been working on contemporary murals in public places since the mid 90’s. Viviana has reached out to street artists in regards to the longevity and protection of their murals. She has advised them on paints, coatings and tagging removal. CHARLES FREEMAN (Brother Boko), a New York born artist, grew up between NewYork and Houston, and moved to Los Angeles in the 1970’s. Among his murals commissioned by the Los Angeles County is the painting on the Bob Hope Patriotic Hall’s exterior wall. It is an interpretation of Archibald Willard’s 1876 painting, The Spirit of ’76. Return to the Light is a twenty five by twenty two feet mural painted on the exterior wall of a four-story building right in front of the Pasadena Freeway. The mural depicts a Tzotzil shaman from Chiapas (Mexico). Pancho Villa and Emiliano Zapata flank the shaman in the center. Also to the sides, the union leader Cesar Chavez and a veteran with a sign that reads: “Homeless disabledvet will work for food”. Towards the top, the portraits of two old Mexican women. At the bottom a young man, being hold by a weeping woman, is bleeding to death. The mural wall is facing north-east, exposed to the warm California sun for most of the day. The shaman’s painted black tunic was completely dried at the time the conservation team took on the task of preserving the monumental artwork. After thoroughly cleaning the soiled surface, the flaking paint layer was consolidated and the surface was protected with a clear coating with UV filters and stabilizers. Return to the Light. Detail of damaged paint layer. Outdoor art is subject to decay due to harsh weather and environmental pollutants such as smoke and soot. Whenever choosing a wall remember that the paint layer exposed to the sun all day will get very warm during the day and cold at night. The paint will expand and contract due to changes on RH and temperature. In addition, the light will produce color fading, which is a chemical reaction and it is irreversible. A wall protected by shade or less exposed to the sun is more suitable for your outdoor painting. Flaking or lose paint means that the paint layer is separating or detaching from the substrate (primer, ground on wall). First the paint cracks forming small “islands” and then looses adhesion to the support. Flaking paint occurs due to a combination of factors. Among them, the expansion and contraction of the paint, the material’s fatigue as well as the lack of addition to the substrate. In most cases, the detachment of the paint layer is the result of the binder failing and/or the wall not well prepared (not enough tooth) for that particular paint. Filipino Americans: A Glorious History, A Golden Legacy, painted by Eliseo Silva, was unveiled in 1997. The City of Los Angeles Board of Cultural Affairs Commissioners awarded the mural its first ever Award of Design Excellence for public art. The murals depict the history of Filipino immigrants in the USA. Over the years the mural was tagged and covered with graffiti paint. By the time the conservation team addressed the restoration worked there were at least three graffiti murals, one on top of the other. After agreeing with the original artist and guided by photographs provided by the Eliseo Silva, the team restored the covered areas. Fillipino Americans. Detail during Treatment.